Home security is a primary concern for you and your family. The team here at Dynamark Security Centers has been providing home security solutions to families in and around the Corpus Christi area since 1990, so we have accumulated a great deal of experience and expertise. We utilize high-tech security solutions to make it virtually impossible for intruders to enter your home undetected. Highly sensitive intrusion detection devices can be installed at each and every point of entry, and you have options with regard to the type of alarm that would be triggered if there is a breach. For example, a system can be programmed to sound an audible alarm. It would alert you and your family, (or a business contact list if commercially used,) scare the intruder off, and automatically send a distress message to central monitoring who will contact local law enforcement dispatchers. The alarm can also notify cell phones of members on your list. 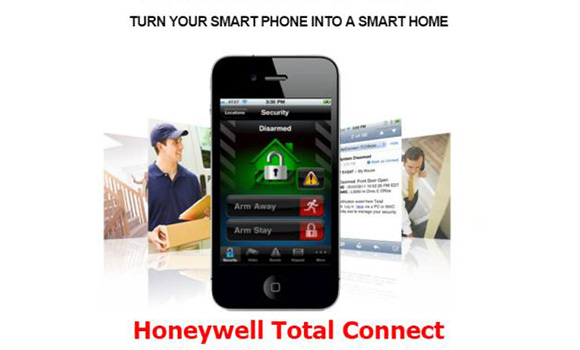 The Honeywell’s Total Connect z-wave system allows users to control their security systems through a mobile app as well as on the panel. This gives you additional benefits you have access to at your fingertips. The system can offer GPS tracking for young or senior drivers, monitoring location and speed, incorporated into your Total Connect App. Another protection enhancement, not commonly known, is the Honeywell’s Asset Protection Sensor. Used in conjunction with the Total Connect system, the Asset Protection Sensor uses “movement-based” theft prevention to guard against not only burglary, but theft. The sensor works with your security system to help keep your valuables safe, even if your alarm panel is disarmed. Contact us to learn more. The home security systems that we provide can protect you and your loved ones when you are at home, and there are other features as well. A system can be programmed to send you a text message or e-mail if one of the intrusion sensors is activated, so you can stay in complete control of your home at all times. Plus, you can extend the security perimeters outside of the actual physical structure. This can be a priority for people who live in secluded areas with long approach lanes and gated entry points. You can be notified if you left the garage door open or if someone is opening it. You can unlock the door if your child forgot their key and with a camera, you can make sure they entered safely. With iphone and android smart phones, you can add on many features to the app so you are always informed and in control. If you are looking for additional smart home automation, the Total Connect system now integrates with the Amazon Echo (Alexa), so you can tell your system to turn down the heat or open the blinds. Dynamark Security Centers is the right choice if you are looking for a custom crafted security solution to keep your business safe and sound. If you are responsible for a Corpus Christi or nearby area business, you have found the ideal commercial security resource. Our team can evaluate your commercial property, become apprised of your objectives, and design an appropriate security system that will protect your business around-the-clock. If you are ready to take the first step toward total safety, security, and peace of mind, contact us or give us a call at (361) 852-5276.